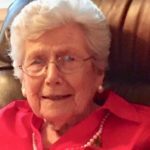 Hattie Paine Mitchell passed away peacefully on Saturday, April 6, 2019 at the age of 101. She was born in Raccoon Bend, Texas, on March 26, 1918 to Mary Paine Perkins and Robert Glover Paine. She is preceded in death by her parents; her husband, Jordan (Jack) H. Mitchell Jr.; a son, Jordan (Jerry) H. Mitchell III; sisters, Sadie Sillavan and Dorothy Knight; brothers, Robert Paine and Ray Paine. She is survived by a son, Glenn R. Mitchell; daughter-in-law Josephine (Josie) Mitchell Cole (Jim); grandchildren, Sheryl Branyon (Ian), Cindy Earley (Alan), Paul Mitchell (Dorothy), Eric Mitchell (Arlene) and Sarah Mitchell. She is also survived by great-grandchildren, Christopher Mitchell, Taylor Earley, Cody Earley, Jordan Earley, Paul (PJ) Mitchell Jr., Kelsey Armentrout, Dakota Armentrout, Alyssa Armentrout, Derrick Pippin, Chris Pippin and many nieces and nephews. Hattie grew up in Texas where she married Jack Mitchell and they later moved to VA with the opening of the Yorktown Oil Refinery. Hattie was a full time mom, but spent many hours giving her time as a children’s Sunday School teacher, a volunteer at the York County food pantry and a volunteer for Meals on Wheels. She regularly visited those in nursing homes and was always ready to help anyone in need. Family was so important to her and she made sure she spent plenty of time with her family in Texas, Colorado and Virginia. She will always be remembered for her compassion, her strong faith, her beautiful smile, her kind words and her sense of humor. To all the children that knew and loved her, she was “Nonny”. A funeral service will be held at 11:00 am on Thursday, April 11, 2019 at Zion United Methodist Church in Seaford with Rev. David Magruder officiating. Interment will follow at Peninsula Memorial Park. The family will receive friends from 6-7 pm on Wednesday, April 10, at Amory Funeral Home, Grafton. Memorial donations may be made to Zion United Methodist Church, PO Box 240, Seaford, VA ,23696 or to the American Cancer Society, 11835 Canon Blvd. Suite A-102, Newport News, VA 23606.